Things aren’t always what they seem around here. The other day I decided, whilst out with the dogs to take them around our top field for a change and whilst doing so I noticed something I hadn’t seen before. As I walked around the field perimeter I was looking to see how the grass was fairing, to establish what attention it would need in the coming weeks to fertilise it or liven it up. It was only then that I saw just how poor the grass in fact was. As fields go it has always produced good grass for the cattle and from a distance the field has continued to be green and so to me it had appeared fine, but things weren’t as they seemed. On closer inspection I saw that a large percentage of the field was moss, large patches of nasty, useless to my cows, moss. 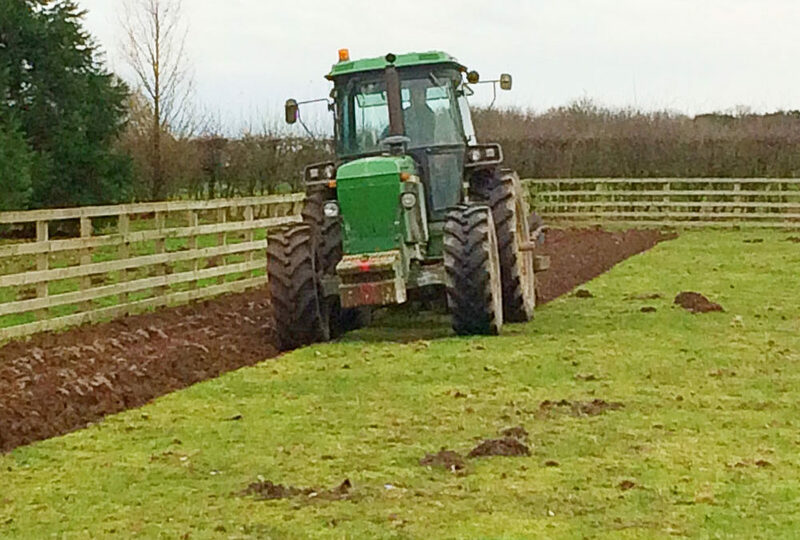 Upon stumbling upon this news I spoke to my friend Gordon, who has several decades more experience than I do in these matters and arranged to get the whole field ploughed and subsequently power harrowed. It looks great and is all prepared and ready for me to seed, which will be done later this week, once again, by hand with a fiddle drill. One way or another I need some good grass on there by late spring, so I’ll keep you posted on it’s progress. We had a bit of unexpected excitement around here this week as we got a call from BBC Radio Leeds, asking if they could interview us live on air. They have been running a feature over the last few weeks titled, ‘New Year, New You’, in which they have spoken about peoples health, exercise, new job, etc and other life changes that people have been making at the start of a new year. So, we set off to Leeds, bright and early on Monday morning and before we knew it, there we were, telling the story of our life change, live on air to their listeners. Hopefully we didn’t sound too much like blethering idiots, you know how so often you dislike the sound of your own voice, when you hear it back, but whatever the case I have been told that we came across fine. It was on the way home that Wendy and I were discussing what had gone on and just how much we have accomplished over the last couple of years and sometimes, because you are so close to it all, you don’t appreciate just quite what has been achieved. Well, after much thought, preparation and talking about it, I have this week commenced with writing my book. It figured that we have quite a story to tell and as so much has gone on, not only in the last few years, but also prior to our life in the country, it was time I told that story. Heaven knows what I will do with it once it’s actually written. Do I self publish, do I talk to publishing companies, do I find an agent and work through them, it’s just another minefield to deal with in our ongoing adventure. Wendy, came up with an idea this week, but I don’t know how realistic it might be. Whilst watching a TV programme, she saw someone using their pig to find truffles in their woodland and that set Wendy’s mind ticking. The only problem is that our pigs, Precious and Petal aren’t trained to find truffles and are a whole lot of pig to handle, but watch this space, because you never know!